Gregory’s Miwok and Maya packs exemplify clean, athletic design with thoughtful features and a fit that adapts and conforms for consistent performance in all terrain. BioSync suspension features flexible tendons that move with you as you bag peaks, shred singletrack, or sprint from summit to summit. New fabrics and thoughtful design updates make these packs even lighter and more intuitive to use on the trail, and upgraded to the BioSync suspension makes them more comfortable than ever before.The Miwok 18 embodies the fast-and-light hiker’s ideals. 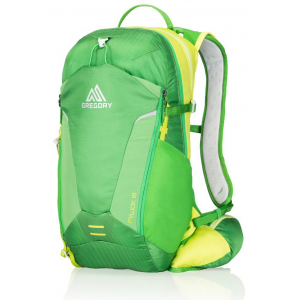 Compact, minimal, and functional, it carries food, water, and lightweight layers while you tick off the vertical, then hugs your back like a frightened monkey as you fly back down the trail. An expanding front pocket lets you stash extra items or a helmet for fast access, and side compression wings add stability during rapid descents.